There are two kinds of staging – the first is where you have a vacant house and you hire a stager that has access to a lot of different furniture and they stage the main rooms of the home – often the living room, dining room, and kitchen, as well as the master bedroom and perhaps the family room and nook. 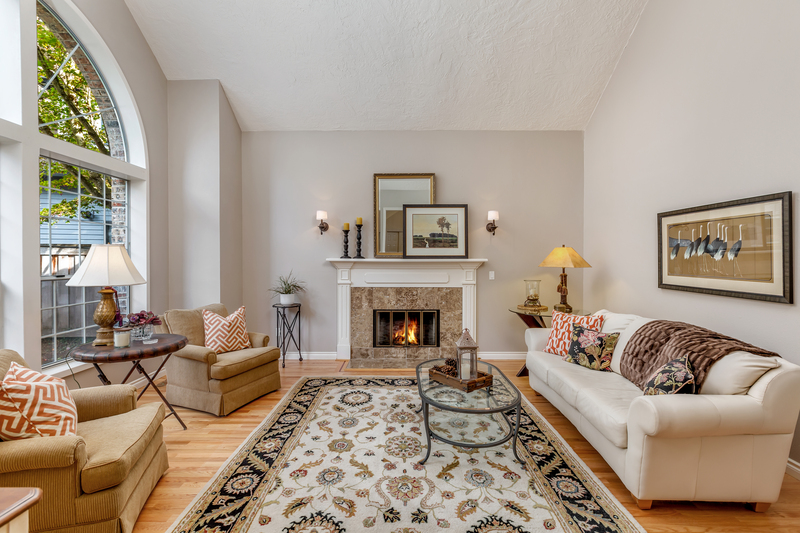 A second type of staging that I specialize in is where, working with my stager, we consult with you on how to present your home to prospective buyers in the best light. 2) sometimes moving items within the home . . . perhaps that picture that Great Aunt Betty gave you is actually too small for the vaulted ceiling it is on and either needs to be moved to a more appropriate space or grouped with other items to make the scale of the art appropriate for the wall. 3) the third action is to bring in some additional items, whether it be art, pillows, mirrors, tchotchkes or other items needed to complete the look. In all cases, the goal is to accent the architectural features of the home, allow prospective buyers to see themselves living there (thus often removing many of the personal photos in the home) and make sure the feel of the home is as updated and well done as possible, so as to suggest how wonderful the spaces would be for the prospective buyer. An example of a success story I had recently is where a Seller listed with a different agent, had over 20 showings and received feedback on only one. The agent had already had them reduce the price of the home $15,000 and most recently had asked (by email) for a $35,000 reduction in price! The Sellers’ got online, saw I did business in the area and had great reviews, and came and asked me to consult with them on selling their home. All I did was restage the home to open up the areas and make the rooms show as pleasing as possible and we reduced the price by $10,000. The first buyer that came through made an offer $5,000 over ask! Sellers were very pleased and wanted to know if I would fly to Denver to help them ‘stage’ their new home! I love my job and put a lot of effort into making sure I do everything possible to help my Sellers get their home sold for top dollar. No stone is left unturned in the work I do for my Sellers.